Myanmar’s army said it found 10 corpses in a mass grave in a largely Rohingya village in Myanmar’s northern Rakhine state, the epicentre of a violent military crackdown that triggered a mass exodus of the Muslim minority. Myanmar’s multi-media news organisation Mizzima News carries an AFP report in this regard. Northern Rakhine has been gutted by violence that erupted on August 25, when the military launched a sweeping operation against Rohingya terrorists who attacked police posts. Myanmar, mainly a Buddhist country, has aggressively denied the charges and largely blocked off access to the conflict zone. 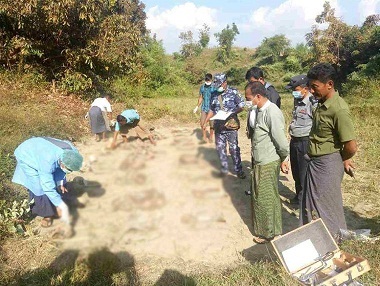 Late Tuesday the army said it had exhumed 10 bodies in a grave discovered earlier in the week in Inn Dinn, a village in Rakhine’s Maungdaw township.